Plane tickets for children under the age of 12 should be exempt from VAT, according to a group of MPs. An Early Day Motion backed by more than 30 politicians is calling on the Government to scrap Air Passenger Duty (APD) for youngsters to help make holidays more affordable for families. They argue that families should not face any additional punitive taxes, as having to book flights during the school holidays means they already pay a premium. The MPs say VAT on a trip to Florida is around £94 per passenger, so a family of four could save £188 if the APD was scrapped. Those travelling to Spain could save £13 per child, leaving them with more cash for holiday essentials such as family travel insurance. Britons currently pay more tax on flights than people anywhere else in the world, with only four other European countries charging a similar tax at all. APD also applies to passengers on domestic flights, so it could hit families wishing to travel from England to Scotland or other parts of the UK. 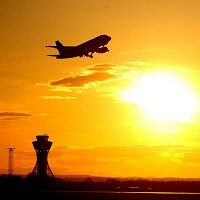 A new poll for campaign group Scrap The Tax On Family Flights has found that four-fifths of Britons believe every child should have an annual family holiday. The research by ComRes also revealed that three in four Britons think it's unfair that families from outside the UK do not get charged APD. Two in three agree with the group of MPs that under-12s should be exempt from APD, just like they are exempt from VAT on clothing and some food items as well as other taxes. Scrap The Tax On Family Flights spokesman Dale Keller said charging children APD puts a strain on family holiday budgets and falls short of "the Government's own family test". Abolishing the tax could help families save on their annual holidays and would only come "at a minimal cost to the Government", he added. Tory MP Andrew Bridgen, who launched the Early Day Motion, said families must be able to have an annual holiday, and ministers could help make this more affordable by scrapping APD.